The summers are here and the heat is getting extreme day by day. Staying indoors is the most convenient way of avoiding the harsh sun, but of course, the daily workers don't have that option. An auto driver from Kolkata however, has found an amazing way to beat the heat. 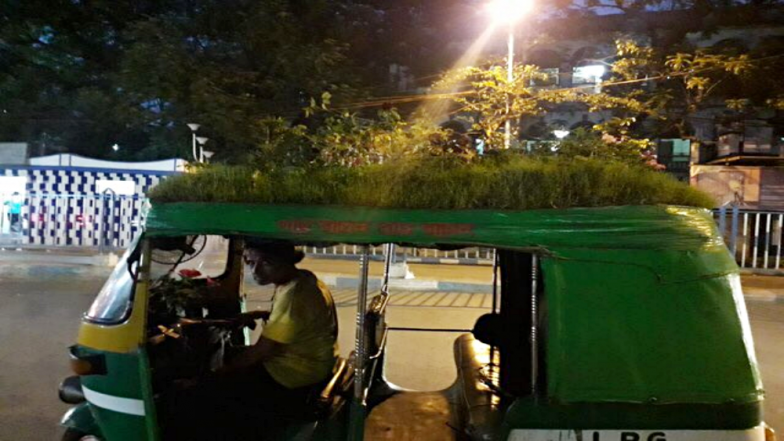 Riding passengers all day can get extremely tiring in the summers, but to keep his autorickshaw cool, he has planted a garden atop his auto! The green and yellow auto rickshaw has a beautiful green cover of grass and small trees, including flowering shrubs. Bijay Pal, the autorickshaw driver also gives out a very important message of 'save trees, save lives.' Pune Man Covers His Auto Rickshaw With Grass and Flowers to Beat The Heat, Watch Video. Bijay Pal decided to plant trees and contribute towards the environment in his own way. It is not easy to maintain a garden that is going to be mobile all day, but he ensures that the money he earns from his ride, is used to maintain the trees. Every evening he waters his plants to keep all the trees alive, which are exposed to the heat all day long. Just along his garden is a message in Bengali that means, 'Save Trees, Save Lives.' Kerala Man Makes Cute Mini Auto Rickshaw for His Kids to Play; Social Media Praises His Skill (Watch Video). Isn't it amazing? Pal is sure creative and passes on a very relevant message. Needless to say, his auto is an instant attraction to everyone and every customer praises him for his efforts. Talking about his idea he was quoted in a report, "For 3-4 years I'd been trying to figure out how to grow plants in my auto. I asked everyone but no one gave me a satisfactory answer. Then found one plant-seller and I asked him to plant some grass on my auto's rooftop. Since then people are very happy (by looking at it) and I too feel very pleased." The trees also help to keep his auto cool and it is a respite to his passengers as well. It is indeed creative of Pal to have managed to maintain a garden so well.